Although Come, Follow me can be carried out without it, the display of card figures is important to the pedagogy of the Program. You can purchase the card silhouettes and wooden kit from the French publisher of the Program: vanminh@editionsdujubile.com or by phone: 00 33 1 53 58 06 07 You can also visit the French Publisher’s website here. All the signs are provide in French, as there are no English-speaking publisher for this material. 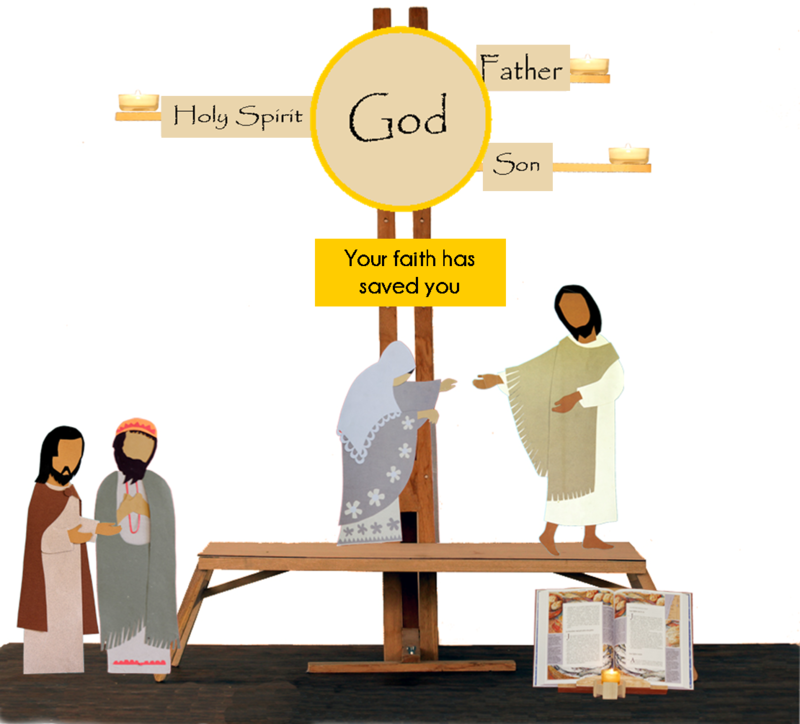 Catechists will have to translate the few signs used in the display, according to the pictures shown in the Catechist’s books. A tall wooden upright stand on which to display the visual aids which illustrate God and his action. This is seen as a double bar in the pictures or it can be replaced by a taller single bar. An easel on which the Bible is displayed. Come follow me Catechesis – Setting up the Kit and Display from Dominican Sisters of St Joseph on Vimeo. Cards (9 inches long) with printed figures to be cut out. Packs of figures are designed for each session. For the moment, the printed words are only available in French, but can easily be replaced with English words, as shown in the eBooks. The purpose of the display is not to illustrate like a cartoon the whole of the biblical scene. The images, which are purposely kept simple, are there to suggest a spiritual attitude. Their aim is to help the children grasp the essential message and form an interior response. In preparing for the session, choose carefully which card figures you will use to illustrate the Scripture passage, and plan when and where they should be displayed and removed during the session. Choose also the phrases to be written out and displayed in order to highlight the biblical text and its corresponding spiritual attitude. Decide when these will be displayed and taken away. For children aged 9 years old and upwards, you may choose other symbols (objects, images…) as well as the figures, which could help present in a deeper way the mystery being proclaimed. Think ahead about the use of the candles: at what time to light them, why – and what they signify. The moments of silence and of singing or the kind of music used must also be planned ahead and discerned when they will be most helpful. In preparing for the session, set up the visual aid in the room and examine it critically for yourself: what is the final display which the children will look at during the time for personal prayer? Whatever is superfluous should be taken away, and what is missing should be added. Finally, go through the whole session with the visual aids, following the Word of God. If there is more than one catechist, tasks can be shared out: who will lead the session? Who will display the card figures and light the candles? Who will look after the music?